Before this past Sunday, I had never attended a NFL game. With the Carolina Panthers making the playoffs, and taking on the San Francisco 49ers, I figured why not check it out. Being mainly a basketball guy, this was going to be, an experience. My buddy Mark showed up to my place with no 49ers gear on, since that’s his team I had to ask why. So we headed out to the stadium, coming from Greensboro it took about an hour and thirty minutes to get there. During that time on the road about 75 percent of the cars on the road had one thing in common: Panthers gear. From flags or stickers on the cars, to jerseys or coats (huge hideous coats I might add), it was clear that everyone was going to that game. When we got to Charlotte the city was live. I mean there were people everywhere to support the Panthers. It had been years since this team made the playoffs so there was a lot of support. There was traffic all down the road to get to the stadium with countless tailgates out on the streets. My favorite part had to be riding thru the tailgate bumping Raise Up” by Petey Pablo, the people loved it. Being in the stadium was a great experience. Of course I was up in the high nosebleeds where Mark claimed “the real fans are”. As I looked throughout the arena all I could see was blue or red. 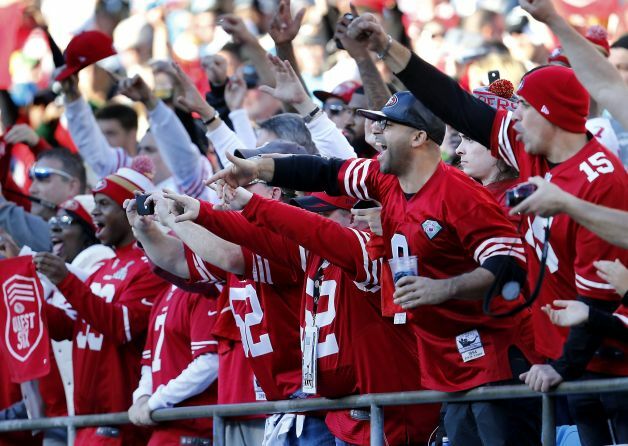 Even though this was the Panthers stadium, 49ers fans came out strong. I rarely saw any Panthers and 49ers fans together but there was so many fans from both sides that there was always room for an argument. Being that I simply wore a Charlotte Bobcats SnapBack and a grey thermal, no one trash talked me. I guess my gear was to neutral because anybody with opposite gear on always stopped to give the other fan a hard time. It was cool to see that passion and support from the fans. When it became apparent that the 9ers had won, countless fans walked out before the game ended. All of that pride and passion that was seen before the game turned into pure anger. Now all the Panther fans were quiet as the 49er fans boasted thru the city. There were plenty of arguments on the streets as neither fan base could let go. I don’t doubt there were any fights I just didn’t witness it. That was my first NFL game but it definitely won’t be my last. I know like last time I’ll be showing up neutral.